The faux documentary Europa Report, already viewable as a download and on demand, gets its theatrical release August 2. The movie’s big presentation in Comic-Con’s Hall H was reported by The Space Review (“Talk of an icy moon at Vegas for Nerds”). Europa Report is receiving positive word-of-mouth from those impressed with its determination to tell a first contact adventure supported by genuine science. Toward that end, the Comic-Con panel boasted as moderator Phil Plait of Bad Astronomy and in addition to the film’s producer, director, composer, and an actor, featured two JPL scientists who served as advisers to the production. Producer Ben Browning said that his motivation was actually to produce a movie about what first contact with alien life might actually be like. 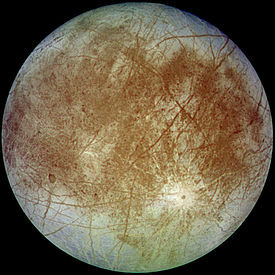 That led to Europa as the focal point. Because they lacked budget, they decided to film the movie as “found footage,” which meant all the work was on a soundstage using fixed cameras. They built an enclosed spacecraft set in Brooklyn with multiple cameras inside and Cordero directed from outside the set using audio commands for his actors. Composer Bear McCreary … explained that scoring Europa Report was difficult, and that he had developed several different approaches to the music and had to abandon all of them while trying to figure out what kind of music should accompany what purports to be a documentary of a human space mission. He said that he achieved a conceptual breakthrough when he started to think of himself as the composer hired by the fictional corporation behind the space mission—and its ostensible documentary. How would that company want to score the documentary? The documentary would be their attempt to put a positive spin on a mission that had gone very badly. Indeed, there isn’t a whiff of satire to “Europa Report,” whose upbeat vision of global cooperation and sincere belief in the life-changing possibilities of space exploration at times skirt the boundaries of naivete. Still, unapologetically pro-science films are sufficiently rare as to make this one’s earnestness seem all the more refreshing. 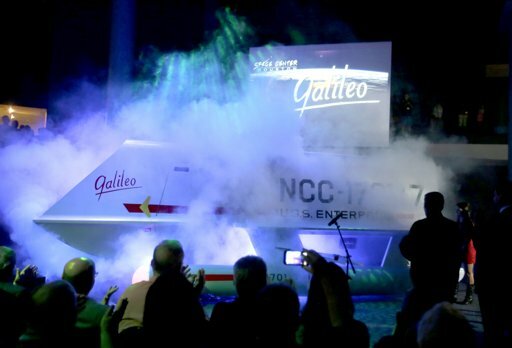 No matter how great they did restoring the shuttlecraft Galileo it still couldn’t fly in to Space Center Houston — that’s just special effects smoke released during the exhibit’s unveiling on July 31. Classic Trek shuttlecraft Galileo, now fully restored, will go on display July 31 at Space Center Houston, the visitor’s center for NASA’s JohnsonSpaceCenter in Texas. Unveiling ceremony will feature celebrities Don Marshall, Lt. Boma from the original 1967 ”Galileo Seven” episode of Star Trek, Robert Picardo, The Doctor in Star Trek: Voyager, Sylvester McCoy, The Seventh Doctor on Doctor Who (and Radagast from The Hobbit), Jason Carter, Ranger Marcus Cole on Babylon 5, Adrienne Wilkinson, Jedi Maris Brood in Star Wars: The Force Unleashed, Marshall Teague, various roles in Star Trek: Deep Space Nine & Star Trek: Voyager, Tracy Scoggins, Captain Elizabeth Lockley from Babylon 5, and Gil Gerard, Captain William Buck Rogers in Buck Rogers in 25th Century. This is a cross-promotion with Space City Con, August 2-4, where several of the guests are appearing. 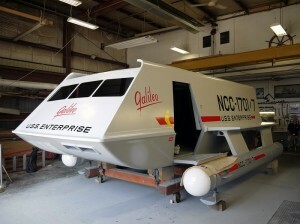 The Galileo’s final berth will be inside Space Center Houston’s Zero-G Diner. 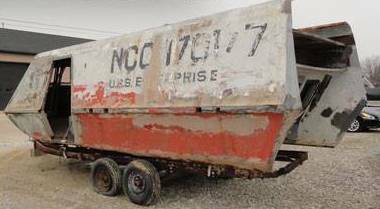 The Galileo restoration project has been led by Adam Schneider, a Principal at Deloitte who is a collector of Star Trek screen-used ship filming miniatures, and Alec Peters, founder of Propworx, which handles studio prop and costume auctions. 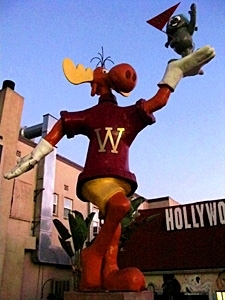 Bullwinkle and Rocky disappeared from their perch on the Sunset Strip on the morning of July 22 reports the LA Weekly blog. Moose and squirrel, when last seen, were being lifted airborne on the end of a crane. The statue had been there since 1961, beside a building that once housed Jay Ward Productions. The sculpture originally parodied an advertisement directly across the street — a spinning cowgirl on a billboard advertising a Las Vegas casino. LA Weekly has heard several theories for the moosenapping, the most appealing of which is DreamWorks will use the statue to promote its 2014 release of Mr. Peabody & Sherman. Since becoming a Gwinnett County inmate following his extradition six months ago, Ed Kramer has filed 370 “inmate requests, pre-grievances and grievances”. Kramer’s complaints allege medical and ADA (Americans with Disabilities Act) issues, and interference with his practice of Orthodox Judaism. “Edward Kramer is the highest maintenance inmate that I recall having in the 17 years that I’ve been sheriff,” Sheriff Butch Conway said. Child molestation charges have been pending against Kramer, co-founder of Dragon*Con, since 2000. Trial had been postponed practically indefinitely based on representations about Kramer’s health and inability to participate in his defense. 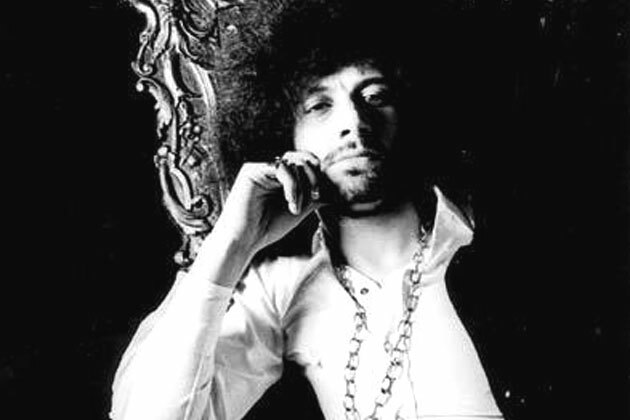 However, he was arrested in Connecticut in circumstances that resulted in his bond being revoked and Kramer being returned to Georgia. The District Attorney has tried to convince the court of Kramer’s capacity to participate by presenting two witnesses who said they observed Kramer walking unhindered (and with a camera) in 2011. He currently is waiting for the defense to return with the results of a medical exam intended to determine Kramer’s fitness for trial. Jay Lake arrives at JayWake. Used under Creative Commons. JayWake. There were all these people. A coffin. 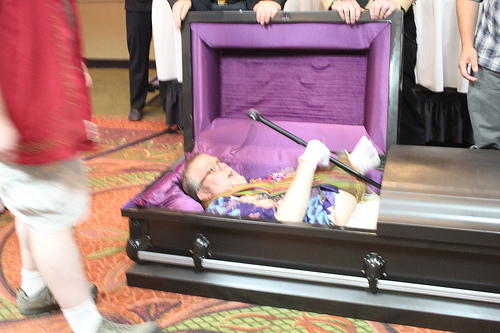 (A very hot, dark, coffin.) Books. Some good food. Friends from Germany, Canada, Connecticut, Texas, Utah, California, Washington, Arizona and elsewhere. A lot of laughter. Some mortification. Deep embarrassment. Profound amusement. Joy. Love. More than I can ever describe, or thank, or return. Ruth Nestvold’s report Saying goodbye with a laugh: The Jay Lake Wake comes highly recommended by Jay. It provides more narrative, and different photos. It was amazingly funny and fun, given the fact that the reason for the party was Jay’s diagnosis as terminal. Once enough people had lovingly abused Jay, he got up to have his own say. The humor left the room for a little while, to be replaced by the seriousness of the situation, which we were all trying to repress, or at least chase away for a couple of hours with a few jokes. 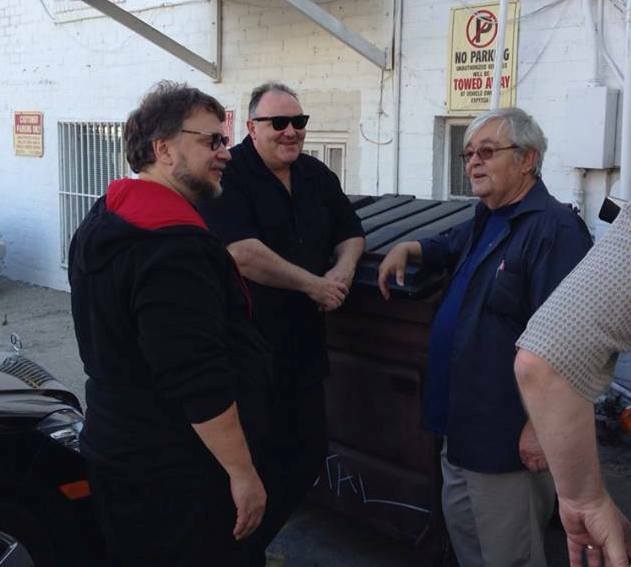 Guillermo del Toro, Peter Atkins and Dennis Etchison in back of Mystery & Imagination Bookshop. Photo by John Sasser. By John King Tarpinian: Guillermo is a kind, unassuming, down to earth man. When he heard a local bookshop, Mystery and Imagination, was just getting by in this age of internet sales and big box book stores he volunteered to do what turns out to be his only official signing of his new book, Pacific Rim, as a fund raiser. Even with his busy schedule of promoting the film he made time to lend a helping hand. The extent of his kindness is best reflected in that the following morning he was off to Japan for the Pacific Rim premiere. Considering the event was at 6:00 p.m. on a Thursday in L.A. there was a great turn-out. Not sure the body count but Guillermo signed for over three hours. Wanting to meet him was two writers in their own right who had never done so, Dennis Etchison and Peter Atkins. It was a warm reception; Guillermo knew of and collected their works. We went upstairs to the signing area to do some preliminary stuff while the new friends got acquainted. Once the event got started Guillermo was more than affable with all in attendance. He spoke with everybody, shook everybody’s hand. Guillermo was great with kids, a few of which had drawn their versions of the Kaiju. He’d stop and look at the drawing showing real appreciation at their attempts. More than a few people in attendance worked for some of the companies that worked on Pacific Rim. One for the company that did the 3D conversion and another that worked on the musical score. Two students were given permission to miss their film school class to meet Guillermo. One bought the Pacific Rim book, the other the Puss N Boots book, both coffee table books. They made sure to get a trade paperback of The Strain for their instructor. Guillermo wrote an absentee excuse in the book for the instructor. What I’d not seen before were people who brought blank 8×10 canvases, which Guillermo obliged them with sketches. The three hours went by very fast. Everybody involved was pleased, the fans and Guillermo. Two bankers-boxes were needed to haul away the gifts people brought. Not to mention that Guillermo was generous enough to give of himself to help out a bookshop he has frequented many times over the years. 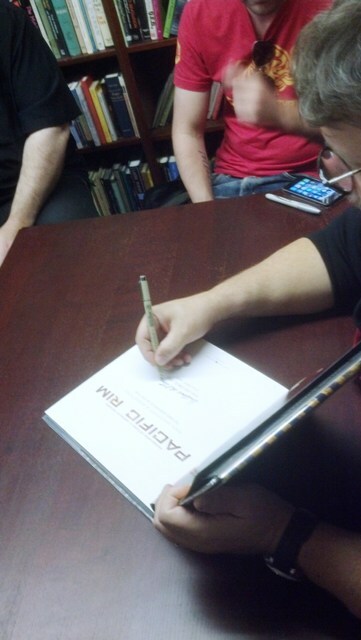 Signing Jim’s copy of Pacific Rim. Photo by John King Tarpinian. And, as David G. Hartwell reminded his Facebook followers, “Mick Farren was also a talented SF and fantasy writer who got too little attention in the USA.” Farren’s career is covered in the Science Fiction Encyclopedia.